Even in a crowded room full of background noise, the human ear is remarkably adept at tuning in to a single voice—a feat that has proved remarkably difficult for computers to match. 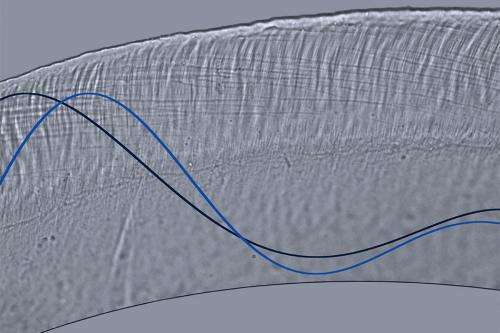 A new analysis of the underlying mechanisms, conducted by researchers at MIT, has provided insights that could ultimately lead to better machine hearing, and perhaps to better hearing aids as well. Our ears' selectivity, it turns out, arises from evolution's precise tuning of a tiny membrane, inside the inner ear, called the tectorial membrane. The viscosity of this membrane—its firmness, or lack thereof—depends on the size and distribution of tiny pores, just a few tens of nanometers wide. This, in turn, provides mechanical filtering that helps to sort out specific sounds. In discriminating among competing sounds, the human ear is "extraordinary compared to conventional speech- and sound-recognition technologies," Freeman says. The exact reasons have remained elusive—but the importance of the tectorial membrane, located inside the cochlea, or inner ear, has become clear in recent years, largely through the work of Freeman and his colleagues. Now it seems that a flawed assumption contributed to the longstanding difficulty in understanding the importance of this membrane. Much of our ability to differentiate among sounds is frequency-based, Freeman says—so researchers had "assumed that the better we could resolve frequency, the better we could hear." But this assumption turns out not always to be true. In fact, Freeman and his co-authors previously found that tectorial membranes with a certain genetic defect are actually highly sensitive to variations in frequency—and the result is worse hearing, not better. The MIT team found "a fundamental tradeoff between how well you can resolve different frequencies and how long it takes to do it," Freeman explains. That makes the finer frequency discrimination too slow to be useful in real-world sound selectivity. The new work explains how the membrane's structure determines how well it filters sound. The team studied two genetic variants that cause nanopores within the tectorial membrane to be smaller or larger than normal. The pore size affects the viscosity of the membrane and its sensitivity to different frequencies. The tectorial membrane is spongelike, riddled with tiny pores. By studying how its viscosity varies with pore size, the team was able to determine that the typical pore size observed in mice—about 40 nanometers across—represents an optimal size for combining frequency discrimination with overall sensitivity. Pores that are larger or smaller impair hearing. "It really changes the way we think about this structure," Ghaffari says. The new findings show that fluid viscosity and pores are actually essential to its performance. Changing the sizes of tectorial membrane nanopores, via biochemical manipulation or other means, can provide unique ways to alter hearing sensitivity and frequency discrimination. William Brownell, a professor of otolaryngology at Baylor College of Medicine, says, "This is the first study to suggest that porosity may affect cochlear tuning." This work, he adds, "could provide insight" into the development of specific hearing problems. Mosquito devices may be used to disperse Australian delinquents—but how do they work?